Follow these tips when crafting a good thank-you note that will be appreciated by its recipient. Whenever someone does something nice for you, it’s always a good idea to show your appreciation. However, if you want to stand out from the crowd, don’t send a text or email. Send a handwritten note instead. With the proliferation of social media, it seems that handwritten correspondences have gone the way of the dinosaurs. Yet don’t you remember the excitement of receiving a card or letter through the mail when you were young? It was tangible, handwritten in the script of the sender. You enjoyed holding it and how it felt. A handwritten note can be picked up time and again to be reread for new understanding and connection. Many people keep their most treasured thank-you notes in a safe place. They remind us that someone cared enough to take the time to think of us. Handwritten notes are just as relevant today, or even more so, as they were a hundred years ago. Here are some tips to crafting the perfect thank-you note. You’ll be more apt to write a quick thank-you note if you have nice note cards on hand. Purchase fold-over or correspondence cards embossed with your own name. Customized note cards can be obtained through retail office supply stores or online specialty stationery stores. 2. Craft a relevant message. In addition to writing “thank you,” acknowledge the recipient's generosity and say a few words about how their action made you feel, or how you used or will use what you received. Reference a single moment that made an impact on you to make your message personal and heartfelt. 3. Don’t worry about being elegant. A simply-written note makes more connection than awkward formality. Write from the heart as if you were speaking to the recipient in person. Keep it short and sweet. 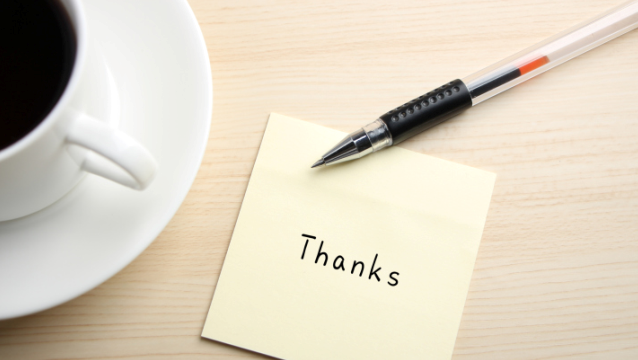 A sincere nthank-you note cannot be outsourced to an assistant or online service. Don’t blow your opportunity to make a good impression with a canned presentation. 5. Always write by hand. Even if you don't have stellar penmanship, do your best. The message will be felt through your words, regardless of how your handwriting looks. It helps to practice what you want to say by writing out your message on a plain piece of paper before putting it on your note. In business letters, you generally sign “Sincerely” or “Best regards.” However, a more personal note deserves a more intimate send-off. Instead of using a redundant “thank you again,” consider a warmer closing such as “With sincere appreciation” or “Yours truly,” then sign your name. 7. Choose a decorative postage stamp. Take the extra step of purchasing stamps from the post office. There are many designs available, from patriotic to commemorative to scenic. Select a few sets that express your personality; just don’t run your thank-you note through the postage machine. The sooner you send the thank-you note, the better. Your promptness will be appreciated. It also demonstrates that even though you are a busy person, you still have time for the personal touch. If you forget to send your thank-you note, don’t be embarrassed about it. Instead, take action. It's better received late than never. The gifts we receive aren't all tangible, but they can cost us a heavy price if we fail to say thanks. Whenever someone gives you his/her time, advice, or helping hand, that's reason enough to express your gratitude in a handwritten thank-you note. It's one of the surest ways to make connections, strengthen emotional ties and forge friendships and business relationships.